Until October 2013, Top Up TV Anytime was a UK digital TV service that captured over 100 hours of TV content a week, to be watched at your leisure. Top Up TV Anytime launched in December 2006 and was a digital TV service that let you watch and record live TV, and watch extra content “on demand”. The services used a special set-top box with a built-in hard-disk that automatically downloaded over 700 TV shows a month that you could view at a time to suit you. Content came from channels such as G.O.L.D, Warner, CBS, BBC, sci-fi channel, National Geographic and Disney. You could also get extra TV channels, including ESPN, Sky Sports and G.O.L.D. Nothing – The service closed on October 2013. With the Top Up TV Anytime service, you could get the standard Freeview channels, plus a selection of TV shows from a number of other channels. Top Up TV’s extra content came in the form of ‘programmes’, not ‘channels’. Before the service closed, there was still a small amount of ‘live’ content from GOLD and ESPN – most of what was on offer was on-demand TV programmes. Sky Sports 1 and 2 joined the Top Up TV lineup in August 2010. Over the course of a week, you’d get up to 120 hours of programmes from a variety of different channels, that were downloaded automatically to your set-top box. The Top Up TV Anytime service consisted of a special set-top box, the Top Up TV+ box, that contains a 160, 250 or 500 gigabyte hard-disk, and a subscription to Top Up TV. As well as being able to receive the 40 Freeview TV channels, this set-top box receives extra TV programmes that received over the air via your TV aerial. 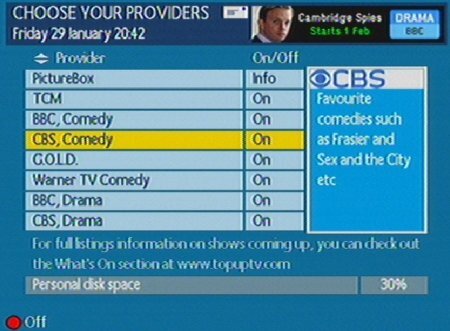 This selection of programmes is stored on the Top Up TV+ box, and you can play them back at a time to suit you. Most of these shows are sent overnight, so you can watch them the next day. To get Top Up TV, you needed to be in a Freeview coverage area (check coverage). No satellite dish or Internet connection was required. The subscription for the Top Up TV Anytime service wass £12.99 a month. In addition, you needed to buy a Top Up TV Anytime set-top box. The standard Top Up TV Anytime set-top box was the Thomson DTI 6300 receiver, which has a twin-tuner and either a 160 gig or 250 gig hard-drive (for up to 180 hours of TV). 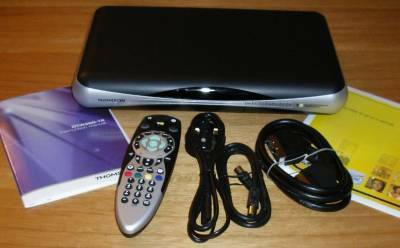 The TopUp TV set-top boxes became available in early December 2006, originally priced at £180. Out of the box, this is what we got with our Anytime delivery: The Thomson DTI-6300 box, remote control (with 2 AA batteries), a user manual, a leaflet of TV remote control setup codes, a basic aerial flylead, a SCART lead and a mains lead. Setting the service up was pretty straightforward – it’s a case of connecting a TV aerial, connecting the box to the TV’s SCART socket and plugging it in. You have to insert the Top Up TV subscription card to get the extra Top Up TV channels and content. To insert the viewing card, open the little cover in the lower-middle of the Anytime box. The card slides in with the gold chip facing down and with the chip-end going in first. 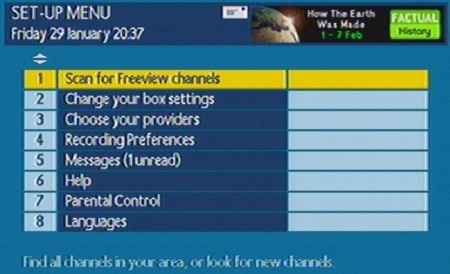 When you switch on the box for the first time, it does a scan for all the channels it can find, both Freeview and Top Up TV. Once the scan’s complete, you’re up and running much as with any Freeview set-top box. You can watch the standard 35-or-so Freeview channels, plus the live content on the Top Up TV channels. At the time of writing, the reduced channel lineup consists of G.O.L.D and UKTV Style – it’s important to note that these channels aren’t broadcast all day, as they are on Sky Digital or Virgin Media, so you only get a limited amount of live viewing selection on these extra channels. If you’re looking to enjoy the extra features of Top Up TV Anytime box as soon as you unpack it – you’ll be disappointed. The box acts as a standard Freeview receiver, until you leave it alone for a while. 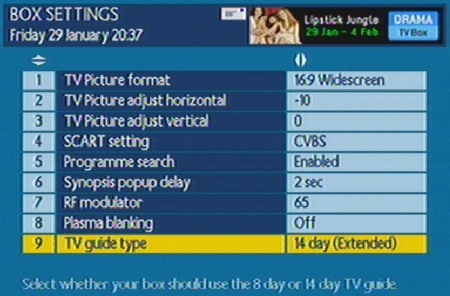 The Electronic Programme Guide (TV listings) gets populated overnight (it has 14 days worth of data to collect), and the first set of TUTV programmes won’t be downloaded for 24 hours, so you have to leave the box on overnight and wait for a selection of TV shows to get downloaded. Our experience is that the EPG is pretty fast, and easy to use. In March 2007, Top Up added Series Link, via an over-the-air software update. You have the option to decide which Top Up TV Anytime channels you’re interested in – content from the channels you select will be downloaded automatically overnight. There’s actually more content available than the box can handle, so it’s important to deselect the channels you don’t want programming from. By removing the channels you’re not interested in, you’ll have more space on the disk for other recordings. The Recording Library is a big part of the Top Up TV Anytime service, and has its own button on the remote. The library gives you access to Freeview content you’ve recorded, as well as the 100 or so hours of selected content that has been downloaded and stored for you. Top Up TV Anytime programmes are sent to your box overnight, so it takes 24 hours for the library to populate with content. Different programmes from different channels are sent each day, so it takes seven days to fill the box to capacity with the selection of Top Up TV programmes. Under ‘TV Setup’, you’re able to select 4:3 or 14:9 widescreen, and you can also set up the SCART output (RGB, CVBS or S-Video). You can also alter the modulated output channel (for TVs without SCARTs). Change how much Live TV you can pause and rewind – The box can buffer 15, 30, 45 or 60 minutes, or this feature can be disabled. Here’s a list and a photo of the connectors that you’ll find at the rear of the Thomson DTI-6300 Top Up TV+ box… From left to right: RF in, RF out, two SCART sockets, two phono audio sockets, a digital audio out socket, S-video out and a mains socket. The box actually has two separate RF in and RF out sockets – the gray block shown to the left ‘loops’ the aerial feed from RF1 out to RF2 in. We got hold of the box in December 2006, and our initial impressions were good. Functionality, speed, picture and sound quality all seemed fine. After using the box for some weeks, we started to see the problems that have been reported by other users, including box lockups, corrupt or blank recordings, missed downloads and random crashes. A fix released in January 2007 addressed some of these problems, and further updates seem to have improved stability..
Top Up TV: Not recommended! With prices from £14 a month for a limited service, we think you can get a much better deal with YouView. On-demand TV, hundreds of hours of content, plus catch-up TV. Available with or without contract! Software updates are sent automatically to your box over-the-air. To check your version number, go to the menu, go to Option 4 (Setup) and select Option 6 (Help). Running a newer version? Let us know. This gives a number of options, including fan speed, box temperature and smart card info. Scrolling down, there are also options for HDD partition check, power mode test, ATAPI reset and force next over-air-download. There seems to be an option to perform a check on the hard-disc, but this wasn’t working for us. Remove power to the unit by removing the power cable from the back of the DTR. Wait 20 seconds and restore the power cable while holding in the standby/power on button on the front panel of the DTR. The DTR will now show the Orange LED with the Green LED flashing until the format has been completed in about 60 seconds. The DTR will return to ON automatically. Recording Freeview channels onto hard-disk, accessing the recording store, or trying to pause live TV, popped up a message: “Warning. You do not have a valid subscription. You must have a subscription to use all the features of this recorder including record, play back and live pause.”, plus a prompt to call 08700 543210 to sort out your subscription. Update: Thanks to one TUTV user for pointing out that this apparently only applies if the box was under a 12 month contract and has defaulted. If you’re on a monthly contract, and cancel, the box works as a normal PVR. See also the thread in our forum on this subject. Connecting the box The Top Up TV+ box has two SCART sockets, an S-Video out, and a modulated co-ax RF output. Typically you’ll connect the output of the box to your TV set using a SCART lead. The second SCART socket is for connection to a video recorder or DVD recorder. When connected to a TV using SCART, use the TV remote to switch to AV / Line Input to view the output of the box. There’s an ‘aerial in’ socket for a feed from your TV aerial, and an ‘aerial out’ so that you can loop the aerial into then out of the box, for connection to a TV or recorder. The aerial output is modulated (meaning that you can connect to a TV that doesn’t have a SCART socket).Note: The VCR SCART socket also acts as a ‘pass-through’, so a connected video or DVD recorder can loop-through to the TV when the Top Up box is in standby. Copying programmes We’ve been asked if you can copy programmes that have been downloaded onto your Top Up TV box – the answer is yes. To copy programmes from the box to a video or DVD recorder, connect a SCART lead from the Top Up TV ‘VCR SCART’ socket, to the input SCART socket on your recorder. Channels If you’re looking for information on new channels coming to TopUp TV Anytime or to Freeview, take a look at our News Page, or sign up to our mailing list for updates. Subtitles Subtitles are now supported on the Top Up TV Anytime box. At launch, subtitles weren’t supported, but in early July 2007, a software patch (v2.81) was released to add subtitles. RF Modulator The Thomson DTI-6300 has an RF Modulator – handy if you want to connect to a TV that doesn’t have a SCART socket, or if you want to send the output to a second room in your home.To enable the RF modulation for the DTI6300 Top Up TV Anytime box, press Menu, go to “Choose your box settings”, select option 7 “RF Modulator”, and use the left and right arrows to pick a channel number between UHF 21 and UHF 68. User Manual Looking for a Top Up TV Anytime / Thomson DTI-6300 User Manual?Thanks to Michael Gledhill for finding the manual online for us – You can download it as a PDF at Top Up TV’s Manuals page.If you’re looking for help with a feature of the Top Up TV Anytime service, try asking in our Top Up TV Forum. Top Up TV on other boxes or TV sets Can I get Top Up TV without having to buy an Anytime box?Top Up TV used to offer a service where, with a suitable subscription card slot, you could get 10 extra channels, but they no longer offer that service.Now, the only way to benefit from the Top Up TV Anytime service, with downloaded TV content, is to get an ‘Anytime’ set-top box. Non-Anytime set-top boxes, PVRs and Digital TV sets, are not able to handle the Top Up TV Anytime content download, so can’t get Anytime. You can order a Top Up TV Anytime box from topuptv.com, Argos and Amazon. Note that some Freeview receivers with a card slot will accept an ESPN subscription card (ESPN on Freeview). You may also want to consider BT Vision, which offers the Freeview channels, plus extra TV shows and movies over Broadband. HD on Top Up TV? 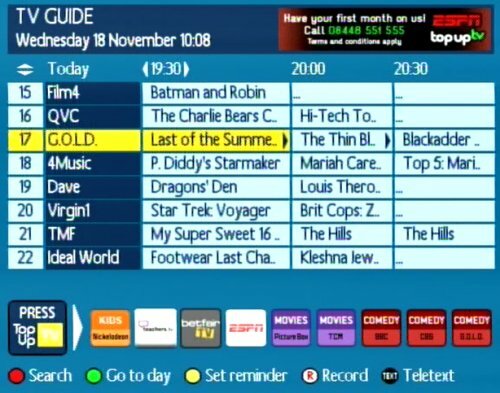 The Top Up TV+ box does not have a high definition connector, and at the time of writing, we’re not aware of any plans for Top Up TV to offer any Hi-Definition programming. 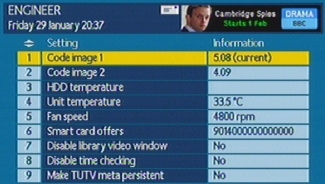 See our notes on HD Freeview on our HDTV page. Record external video We’ve been asked if it’s possible to use the Top Up TV Anytime box to record external video – for example from another digital supplier such as Virgin Media or Sky. Sorry – but the answer’s no – the box can’t be used to record from external equipment such as another set-top box. Check which channels you have set to record. Go into Menu > Customise TUTV Anytime. Select the channels you’re interested in – and look at the counter to see how many hours a week you’ve set to record. On the remote, press the TV button, then press and hold the ‘OK’ and ‘AV’ buttons together. The TV button will flash twice. Picturebox Picturebox is a movie service available via Top Up TV Anytime. Site visitor Mel asked us: “Can you just subscribe to Picture Box, and not the Anytime package for £5/month?”It seems so. According to the Picturebox site , the subscription is £5 a month regardless of whether you’re a TUTV customer or not. Contact TopUp TV to voice your concern. If you’re not happy, you can cancel your account.